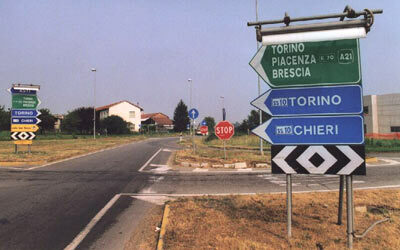 Horizontal signs system is nowadays an imperative necessity. Continue sign lines at the outer sides of the carriageway bound the external road borders and broken lines to show the middle of the road and the overtaking authorization are absolutely necessary. 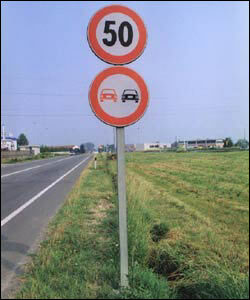 Arrows and other different signs help motorists to improve their driving behaviour. Supplied in white and yellow colours, the paint is retro-reflective. To increase their optical impact glass beads are used. We also supply paint sprayer machines. Presently, road signs are mandatory. We aim to improve safety on the roads by adapting to the most advanced international rules. They can be supplied on steel or aluminium support, with "Engineer Grade" or "High Intensity" film, into standard sizes established by the Ministry of Transports of the different Countries. With the exception of warning and priority signs (triangles) and prohibition and obligation signs (discs) we can supply other shapes (arrows, squares or rectangles) according to the customer's requirements, with colours and dimensions as specified by the contract documents or the Country's laws and dispositions. 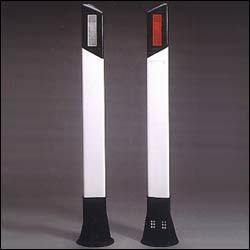 Stiff or flexible, these white PVC posts with a black cap and two reflectors (usually white and red) on both sides are particularly useful to give the motorist a visual indication where the road border is (when there is a not dangerous slope and therefore it's not a matter to install a rigid safety fence). We also supply reflectors for barriers (either metallic or concrete) and light-breakers for median barriers.